What better way to depict the dark and gory underworld and cop politics of Mumbai, than through a graphic novel? The underbelly is fantastically done with shades of brown, black and grey. 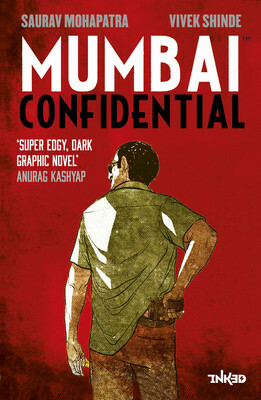 Sometimes it also may happen that some graphic novels fail to convey what they want to, but that is not the case with “Mumbai Confidential” by Saurav Mohapatra and Vivek Shinde. The book is set in Mumbai (but of course). It is the story of a cop, rather an ex-cop, Arjun Kadam who had it all going for him, till it all fell apart – both personally and professionally. He is no longer the man he used to be. He is addicted to heroin. He somehow has no will to live. There is the ACP who used to be his mentor and still considers him to be his protégé. Another cop is after his life. To top it all, there is a hit and run and Kadam survives, but a young urchin loses her life and Kadam will do all it takes to bring her justice. There is everything in this graphic novel. It is fast-paced, riveting and has Bollywood with doses of underworld and suspense. However, the personal tragedy that occurs with Kadam should have been brought out well in my opinion. It was too rushed. The illustrations are terrific. They bind you and make you spend time on every page than just flip them soon enough. The blocks and the blurbs are uniquely done. There is an effort put here to tell a story, to see it through from start to finish in a well-coordinated manner. The graphics depict the city’s dark side brilliantly. Vivek Shinde’s art and Mohapatra’s storytelling goes hand in hand quite well, providing the reader with a rollercoaster of a ride, laced with delusion, despair and some hope. This entry was posted in Books, Inked, Penguin Books, penguin india, Review and tagged Bollywood, Cops, graphic novel, Inked, mumbai, Mumbai Confidential, penguin books, Underbelly on July 23, 2014 by thehungryreader.